V. Leap (2") 3 1/2"
Notes: This usually manifests as a steady stare without blinking, occasional fascination by small moving objects, an urge to bat as things on his desk or on nearby tables, and an occasional chase for no reason if someone happens to run by, etc. Notes: This will usually result in the offending hand being rather violently knocked away (see Cat-Fu Block). Notes: with Concealment, Shadowing, Stealth. Due to his natural coloring it is easier for Dusk to hide in shadows or semi-obscuring cover such as leafy vegetation and trees. Notes: Dusk can only perceive dangers to himself and is based on a form of Area Effect Telepathy that allows him to pick up on intent. 'Intent' not only means intent to harm him but also intent to touch him. Notes: He does not like to use this power generally but that has never stopped him from doing so. Usually he will only try to read surface thoughts allowing anything extra to cover his intrusion. This is particularly handy when on a con. Notes: This would be his 'go to' power in the event of attack or pursuit. Notes: He has become adept at finding people mentally and can cover a huge area encompassing as many as one million people at one time. Notes: He is capable of swapping minds with his target and this is quite literal. His mind will inhabit another's body but that person's mind will inhabit his own. Physical powers and skills remain with the original body. Mental powers and skills are transferred. As this power will cost 60 END and he only has 30, using this power will burn 15d6 of Stun from his body so that the new inhabitant would most probably arrive in an unconscious state. Notes: This seems to be a natural defense mechanism that he has had since birth and his true cat-like form did not make itself known to others outside of his family until he was about 13. One minor problem is his tail ... yes, he has one and occasionally it will 'escape'. Notes: This isn't so much a martial arts style as an instinctive form of defense. 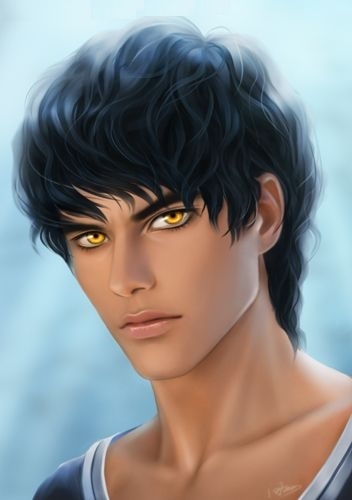 Dusk appears to be a good-looking boy of average height and a muscular build with hair that is shaded from light gray to black. Most mistake this for a dye job. It is, however, his natural coloring as is the amber of his eyes that actually tend more toward yellow. In his normal state, however, he appears as an anthromorphic cat leaning heavily toward full human. He has three outstanding features in this form, his cat ears, his tail and the fur covering his body. He does not have the leg structure or body structure associated with felines. To find one lost child in a life time was a blessing and beneath the notice of someone with an over-inflated sense of self-importance such as that possessed by Special Agent in Charge Reginald Miller. When headlines announce of the finding of a ninth child in only three months by same person, Miller could draw only two possible conclusions. Either the person making the discoveries was a serial kidnapper, or they possessed supernatural, i.e. meta-human, powers. Miller was not immediately able to locate his target and, true to his nature, resorted to under-handed methods to smoke his quarry out. A news article appeared in the newspaper and on local the Portland stations later that week seeking information about a six year-old girl that had gone missing in the area. The 'missing' girl was actually the daughter of Special Agent Donna Sandoval of the Portland field office and quite safe at her aunt's home outside of the city. Within the hour they received a phone call reporting the child's location. Less than 15 minutes later an Army Blackhawk dropped into the field of a working farm and three men is black business suit climbed out. Agent Miller surveyed the area, two large, rather rundown barns, and a large two story house and close to a dozen gaily painted wagons. The wagons each had a plume of smoke wafting from a miniscule stack, indicating to Miller that they were more than for show. From the house a heavy-set woman of late middle years stepped out, wiping her hands on her apron. She did not approach the men but eyed them suspiciously. Miller gestured for the pilot to shut down with a slashing gestures and gradually noise roar of the blades dissipated into a whoosh. The woman folded her arms and waited. Miller sighed and crossed the field to stop at the bottom of the house's steps. He produced the standard issue wallet and let it fall open to reveal his badge and ID card, leaving it open long enough for the woman to take a step forward and read it. "What can I do for you, Agent Miller?" she asked in a low, husky voice. She glanced over Miller's shoulder at his two side kicks, both of whom had started toward the wagons. "You are?" Miller tone of inquiry wasn't quite demanding. "April Showers," she replied without cracking a smile. "If your boys are going to get much closer to those wagons, you better produce a warrant, Agent Miller." At her words, five of the wagons' doors opened and five men, all with a broken open double-barreled shotgun hanging from a forearm stepped out onto a small porch. The two men stopped mid-gesture and let their hands fall from the inside or their jackets. "We aren't here to cause any trouble, Ms. Showers," Miller said. "In fact, I have a proposition for you." "What kind of propostion?" she asked suspiciously. "Why don't we start with a deed to this property?" Miller said. Dusk Leaf sat across the table from his mother and the government guy trying to take it all in. He'd readily admitted that he had been 'finding' lost children for the past few months, he'd never tried to keep it a secret. Then things got weird. Miller, the guy in the black suit, told him that he was a meta-human. He'd heard a couple of little stories about them but had never even considered that his ability to find missing kids might be a 'power'. Okay, not really, after all, he was a cat boy. Yup, he'd been born with cat ears, a tail and covered with fur but it really wasn't noticable. It sounded strange even to him but it was true, no one, except his mother, was aware of it. His mom knew, of course, and the mid-wife that had delivered him had known but no one else, and when the mid-wife died only a few months later, it was only is mother. He hadn't given his appearance much thought since everyone he met saw pretty much what they expected, a boy, with the dark gypsy features and good looks of his father. It had remained that way until about a year ago. It had been a girl ... she was an outsider, from up the road at Glenwood. He'd biked down to pick up some salt and sugar, a couple of the few things they didn't grow at the farm. She was blond and a little younger but she was also beautiful. They talked, well, mostly she talked, and he made more and more frequent trips to town just to visit her. AS things were wont to progress they reached a point of mutual attraction and things proceeded. It had be a kiss that revealed him to her. He hadn't considered how she might react to finding that hs face was covered by invisible fur, but she'd surprised him. She didn't pull away or even hesitate, but kissed him again. After a couple of months of the hot and heavy they'd begun to explore each other in more intimate ways but she was the more pragmatic of the two and when it came time to go all the way, she'd been worried about getting pregnant. In a town the size of Glenwood, it was impossible to hide any type of relationship so when he purchased a box of condoms, the news was in Portland before he got home. "Who is she," his mother had asked as he came into the kitchen. He tried to act innocect, but it was a futile effort, his mom could read him. His mother nodded, "Her dad called." Dusk dropped his head. "Don't tell me, never come near my daughter again." "Sounds about right, without all the name calling," mom replied. "She find out about the fur?" "Yeah," he said. "But she won't tell anyone." "We'll see," she said. "But ... you know it was for the best." Now this guy, Miller, was offering to get them the deed to the land his family had been squatting on for five years, to give them a place they couldn't be chased away from. And he was offering a college education, something he'd never in his wildest dreams had even considered as possible. No one in his family had much more than a fragmented high school education. When Miler told him 'any subject at any school' he knew what he was going to do. He had left with them in the helocopter and found himself in San Diego the next day. Dusk is a powerful telepath but he doesn't like using the power as it tells him more about his target then he'd really like to know. He'd prefer to learn something the old fashion way by talking it out of his subject. On the other hand he has no problem at all with searching out someone using his Mind Finding (Mind Scan) power and he is probably unsurpassed at finding people if they are in his search area. That search area isn't about literal size of the area but rather the number of people IN that area. Dusk is able to sift through something like a million minds at a time. This ability will probably be his main contribution to the Minuteman Project though at some point he does expect to be asked to read a suspect's mind. As seems to be common with Mentalist type Meta-humans, he is also calable of delivering a psionic attack that can stun and even render a target unconsious. Telepathy and Mind Scan are not his most powerful talent, however. That would be his ability to swap bodies with a target, literally. He can transfer his consciousness into another's body but the consciousness of his target will be moved into his own body. This transfer does not alter the body's physical powers or skill but any Mental powers or skills will be tranferred to the new host body giving Dusk the use of all of his Mental powers as well as any physical powers that his new host may have. Use of this power burns 20 END and may take more than one try. With Dusk's body only has 30 END it is possible for the new tenant to be unconscious for some time after the transfer. When returning to his body, the body he is leaving would be subject to the same restriction. This means the new occupant of his body will arrive in an unconscious state perhaps bordering on a coma. Conversely his departure from a host body means the original inhabitant will commonly be return to his own body also in an unconscious state. How, exactly, this power might prove useful to the Minuteman teams remains to be seen. Perhaps the most remarkable ascept of Dusk's Meta-humaness is his physical appearance and his natural ability to disguise that appearance. Dusk, in the venacular of Japanese pop culture, is a catboy, complete with the ears, the fur and the tail. Somehow his powers are able to create the illusion that he is a 'normal' teenage boy. The 'illusion' is only visual and should someone touch him, expecting bare skin, they would instead find soft fur. Knowing this could give him away has lead him to develop an aversion to being touched, especially if that touch is unexpected. Dusk is playful, short-tempered, curious and a flirt. He plans to study law and intends to graduate from Harvard. He is also highly self-sufficient and as independent as any cat. He is partial to spicy Mexican food, and prefers to drink water or fruit juice. His favorite movie genre is action advanture and his current is The Fast and the Furious which has led him to a new hobby, building model cars. While Dusk's powers in many ways appear similar to Deb Ange's Point of View, however, rather than 'physically' traveling about to find her target, Dusk zeros in on a particular mind without the necessary 'travel' to get there. Like all of my characters, Dusk has gone through several rebuilds as I discover more about him and like all of my characters, I have intended for him to be somewhere around 350 points ... and that got out of hand rather quickly.